Artemis, goddess of the hunt! Photos courtesy of Clinton Critter Care. Today’s adoptable is of the “scaled and finned” variety. Super-exciting, considering that it can be a bit more difficult to find animals other than cats and dogs available for adoption in the Kansas City area! As it just so happens, Clinton Critter Care specializes in less traditional companion animals. In addition to Artemis, they also have a lizard named Cleopatra in need of a new home. So go give ’em a look and spread the word, mkay? We are looking for an experienced and educated bearded dragon owner to adopt Artemis (lovingly nicknamed “Artie”), an approximately 8 year old female bearded dragon. We believe she might be a citrus or be a citrus hypo. She was surrendered to us by a family in Columbia MO who could no longer care for her or give her the attention she needs. Artemis requires an adequate enclosure of a 40 gallon breeder tank at LEAST, or ideally an enclosure with 55 gallons or more, with strong UVB lighting (regular light bulbs do not contain UVB light), a basking spot with undertank heater, and a cool side to the enclosure. She has to have fresh water daily treated with Repti-Safe or equivalent to remove chlorine and other heavy metals from the water, as well as lots of fresh greens and other fruits and veggies that HAVE to be replaced DAILY. She also has to have a regular weekly source of insects such as dubia cockroaches (preferred) or crickets, dusted with reptile vitamins. She also enjoys and will eat Fluker’s Bearded Dragon Diet (red pellets). Also required are climbing limbs in her enclosure. She also needs regular “out of cage” exercise time, and we highly recommend a good bearded dragon leash for ease of mobility while keeping it safe, and weekly baths in warm repti-safe treated water. Artie is missing the end of her tail, due to being housed together with a male bearded dragon before coming to us. We recommend that Bearded Dragons ALWAYS be housed by themselves as they are naturally solitary reptiles. Artemis’ adoption fee is $75 and she is located in Clinton,Missouri. If you cannot provide a loving forever home for Artemis, please help us to care for her and other bearded dragons we rescue by donating an item to them off of our Amazon.com wishlist for our reptiles, including bearded dragons! They are in need of heat lamps, bearded dragon food, repti-safe or equivalent for their water, or anything else on our reptile wishlist. It will be sent directly to us, and will be put directly towards the care of this or other reptiles in the future we may rescue! Thank you! Posted: 01/25/13 at 11:53 am. Filed under: Find-a-Friend Friday. 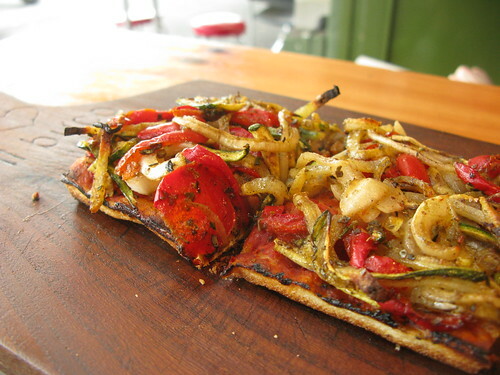 Two slices of ‘za from Il Buco in Auckland! Posted: 01/19/13 at 9:52 am. Filed under: Saturday Garbage Plate. Photos courtesy of Friends of Parkville Animal Shelter. Poor Saphron! A senior lady, she lost the tips of her ears to frostbite before she found her way to the Friends of Parkville Animal Shelter. In 2009! And she’s still looking for a home. So someone give her one, okay? Meet Saphron, a beauty of a cat, looking for someone to take her in. Part of her ears have actually fallen off due to frostbite from being outside when we got her on a cold Feb. in 2009. But we think it only makes her even more cute. Saphron does not like other cats so she would really do best to be in a home where she is the only pet. Saphron’s not too fond of being stuck in the shelter, but the person who brought her in said that she was very well behaved and quite loving while staying at his house. This beautiful white girl has had to endure a lot and now she deserves a quiet, loving home with a patient family. She is a member of the Lonely Hearts Club at FOPAS so her adoption fee is $50.00 and she gets to go home in a gently used carrier. Come by the shelter to meet beautiful Saphron at 1356 N 9 HWY in Parkville or call 816.587.0918 to make an appointment to meet this beauty! More about Saphron- I’m so misunderstood! Posted: 01/18/13 at 12:45 pm. Filed under: Find-a-Friend Friday. CC image via Rambling Vegan on flickr. 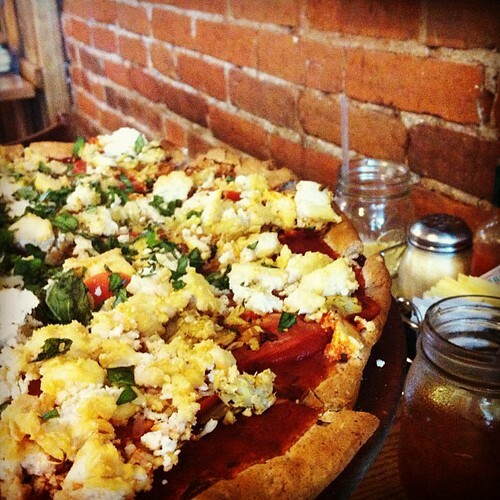 veganlyyours: 12/1 Blackbird Pizzeria during day trip to Philly! Posted: 01/12/13 at 10:13 am. Filed under: Saturday Garbage Plate.